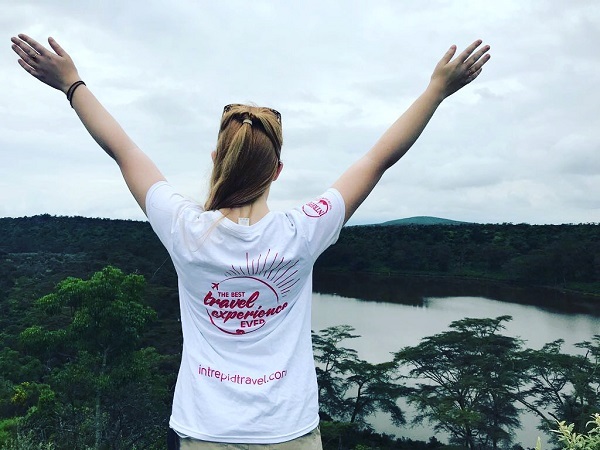 Elodie Pethybridge, Travel Consultant at our Norwich travel agents in store at Jarrolds, was lucky enough to experience a true African adventure with Intrepid Travel. Here’s her report about the highlights of a trip that included camping with the Maasai tribe. The outbound flight was comfortable and operated well with friendly and efficient staff. However, on the inbound flight, there was a marked difference in the quality of service. In the row of three that I was in, only one of the screens worked and facing a nine-hour flight home with no onboard entertainment was a bit of a pain. There was no solution either when we reported it to the airline staff. There was also limited food on the plane; on both occasions (dinner and breakfast) the meal selection had run out before we were served. I would say I was pleased to be getting off the plane when we landed back in Heathrow as it wasn't the best experience, but didn't detract from such a fabulous trip. Our first and last night was based in the Comfort Inn Suites in Nairobi. The rooms were a good size, clean and fit for purpose. On our return at the end of the trip, it felt like the Ritz after six nights of camping in various campsites around Lake Nakuru, Lake Naivasha and the Maasai Mara. Whilst camping, we shared two-man tents. These were simple to put up and take down (compared to my previous experience of assembling tents), however, putting a wet tent away isn't always the easiest thing to do. The campsites that we stayed at had varying standard of facilities. For example, Mara Springs Camping had relatively clean showers with hot running water 80% of the time, with a bar and kitchen area for customers to use. This was a stark contrast to the night we spent camping with the Maasai, where there was a very simple long drop toilet with no door and a similar situation for the shower too. Cray Fish Camping was my favourite. We spent two nights here and there was the option to 'upgrade', which my campmate and I took up in a heartbeat. I did feel like I was cheating slightly, having gone to camp and chickened out for two nights, but it was so worth it for a hot shower! Our room was very basic, but it had a bed so I was very happy to get a good night’s sleep. On arrival in Nairobi, we were whisked off and treated to an Urban Adventure; a sister company to Intrepid who provide day trips to smaller and lesser-known parts of a destination – be it a city, farm or pub crawl. We were taken to a farm just outside of Nairobi, where we were greeted by three grandmothers singing and dancing to welcome us. Urban Adventures fund piglets for ladies like these and this is what they base their income on. So we saw the pigs that they are raising and then we were welcomed into their home for lunch and a cup of tea. They told us their stories and how Urban Adventures has made a difference to them and their family’s livelihoods. It was a very humbling experience for me. 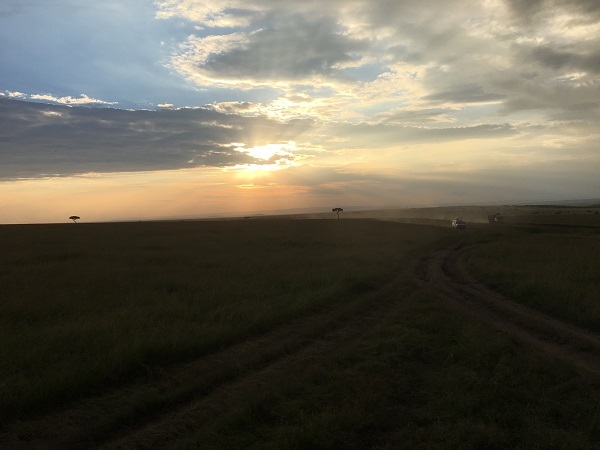 Our trip included a total of three game drives in Lake Nakuru and the Maasai Mara. This was a new experience for me, having never been on safari. We saw the Big Five – leopard, rhinoceros, elephant, lion and buffalo. I have to admit, my favourite safari animal is the giraffe. There is something really fascinating about them. They are the oddest looking creatures and I felt like they were fictional. However, they are very real and most happy in human company, willingly standing and posing for you while you are taking their picture. One of the optional activities was the 'Walk-in Crater Lake Game Sanctuary'. As well as being rewarded for the long walk/climb to the top of the cliff with a beautiful view of Crater Lake, a giraffe walked right onto the footpath we were using and stood there looking at us while we all took picture and selfies. Another optional activity that I can recommend is a visit to Hell's Gate National Park. The park is where the Disney producers went to get their inspiration for the Lion King. Here, you will find the original Pride Rock and the gorge that the stampede scene was based on. Being a massive Disney/Lion King fan this was a fantastic experience for me, and definitely one of my highlights. Also included was a Maasai Mara village walk. En-route, the Maasai warriors sang and danced. They also played a slightly terrifying game where there are two teams and they both have one shield. And the aim of the game is to throw as many sticks at one other as quickly as you can. I know it sounds crazy... and frankly it was. However, some of the group joined in and might have enjoyed themselves a little too much! This was then followed on by meeting a Maasai community of children and elders. The children were fascinated with us, touching our hair and playing clapping games. One of our group showed them how to make shadow puppets on the wall and Snapchat filters and they were just transfixed. The highlight of this trip that will stay with me forever is the moment that we saw a lion sleeping amongst the bushes. I don't know how our tour leader Stanley (Mambo) spotted him but we were driving along the track and he said to stop and reverse onto the grasslands. 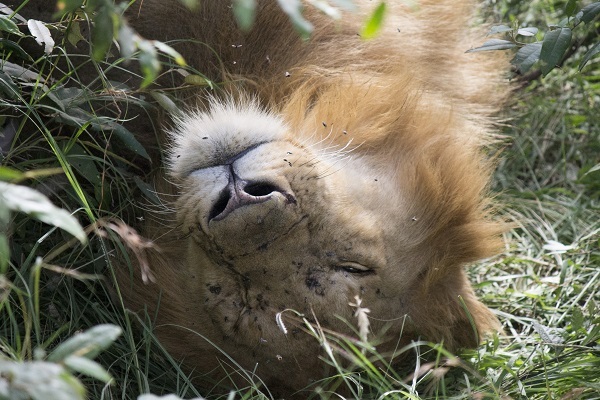 Our driver Stoney (who was also superb) did just that and, sleeping in the bushes to keep out of the hot sun, there was a fully grown male lion. He was sleeping very peacefully and wasn't bothered in the slightest that we were there. He rolled over and for a second and opened his eyes, which was just incredible. All of the drivers have radios so they can let one another know when they have seen something, but we were on our own with him for at least ten minutes before the other trucks started swarming in. At this point, we left to carry on our game drive. The crew that we had on this trip was a massive part of the enjoyment for all of us. Mambo was our tour leader. We would meet in the evening after dinner for the 'PFT' (plan for tomorrow), where he would tell us the itinerary and the actives for the next day. He led our game drives and there is no question he can't answer. His knowledge and experience were second-to-none and he made the whole trip so insightful. 'King' Albert was our chef. Catering for 20+ people three times a day is no mean feat! His food was incredible and it was a pleasure to help with cooking and washing up. And, finally, Stoney our driver. The African terrain can be a very difficult thing to navigate, however, with skills like his, it’s a piece of cake! I would recommend this trip to a certain kind of person. You would have to be up for an adventure and have a certain level of physical fitness as some of the walks could be difficult if you have reduced mobility. Having said that, this trip was incredible and a truly once-in-a-lifetime experience. I wouldn't have chosen this type of holiday for myself so I am incredibly grateful for this experience and I certainly won't be forgetting it any time soon. It’s the perfect trip for an authentic insight into Kenya and the wonders it has on offer. If you would like to plan your own safari holiday like Elodie’s, our team can offer some expert advice. Call us today or come and speak to us at any of our travel agents in Hampshire, Dorset, Suffolk, Essex or Norfolk.